Well, I am. I explain to my students that my job as a "teacher" is to help them find their way. How they think will center them as they find their bearings or 'true north' on their own journeys through life. So there I am, a paper doll, holding my own compass. That represents my physical being. You will also note that I have another compass as my halo. That is my mind & spirit. The rule is as long as we don't cry, we're not lost. So true. Also note other symbols- butterfly wings and birds that represent migrations, so eminent in the natural course of life. My shirt is a map of the Northeast US, my home The half globes make up my tiered skirt represent everywhere else I've been in the world. The pinwheel sometimes takes me where the wind blows. The sun, moon and stars represent celestial navigation and also directional time, as the sun rises in the East and sets in the West. The Northern Lights are another reference to True North. I actually saw them once. Magical. I've also seen the Southern Cross, but that's another story. 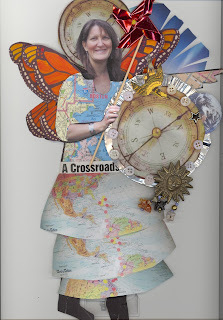 Mixed Media Collage 8" x 14"
whoa - love this image & all that it represents!